Installing a new roof is one of the biggest investments you will make in your home. Since your home is one of your biggest investments overall, who you hire to install your roof is a crucial decision. Usually when you need a new roof, the old roofing has been on your house for a long time. This means that there may be underlying damage that has gone unnoticed. If the roof has been maintained (kept clean, gutters functioning, periodic inspection) there may be little or no damage to the sub-structure. 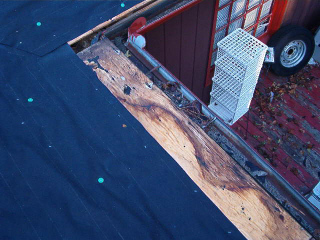 It is not uncommon when re-roofing a house to have to replace some rotted wood. The question is how much needs to be replaced and when will you find out about it? You should know UP FRONT what is included in the cost of your new roof. NOT after work has started and you are trapped into whatever the additional cost may be. I will concede it is impossible sometimes to know EXACTLY how much additional repair work will be needed, but a qualified professional will be able to estimate close enough to give a FIXED price. For these and other reasons, ALL our work is priced on a flat rate basis. The price quoted is the price you pay. No matter how long the job takes, no matter how much additional material is required. 26 years in the roofing business gives us the confidence to bid the job right and to do the job right. 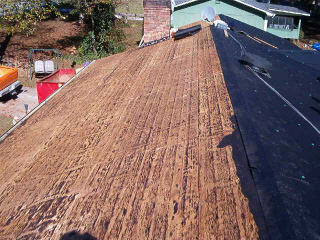 If your roof is not installed properly, you will have problems that might not show up right away. For instance voided manufacturer's warranty, leaks, and incidental damage. If you have problems with your roof 8-10 years after it is installed, will your roofer come back? Will you be able to find your roofer? ALL OUR NEW ROOFS ARE WORKMANSHIP WARRANTEED AT LEAST 10 YEARS! We will be glad to provide a consultation and estimate on your roofing project, explain the entire process, and provide references of satisfied roofing customers. Check our Contact Us page for our number. Click here to see the types of roofing we do!